It’s a wonderful thing when one is given the chance to look at the world through the eyes of an artist, to understand the idea and image of a tree, for instance, from an individual artist’s point of view. 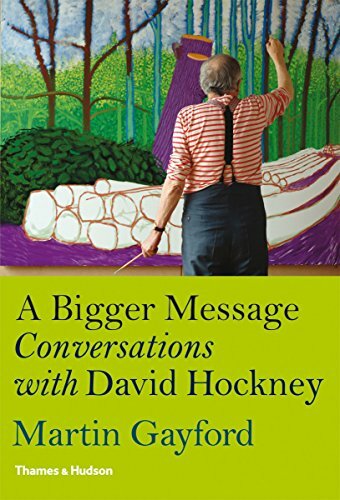 This is the gift we are given in the new book A Bigger Message: Conversations with David Hockney by Martin Gayford. Art critic and journalist Martin Gayford early on establishes and easy and gentle dialogue with the famed artist, one that allows each to express himself on topics far removed from canvases and paints, topics ranging a consideration on the gender of trees to Hockney’s love of technology, and his “struggle with photography,” to put it into Gayford’s words, his desire to blend media into an ever-more-potent visual statement. “Do you remember Walt Disney’s Fantasia? In the original version, they used Stravinsky’s ‘The Rite of Spring’ for one section. But they didn’t get what Stravinsky’s music was about—they used dinosaurs trampling about. A Bigger Message makes for marvelous reading, for artists and non-artists alike. The section dedicated to the discussion of photography, begun with a consideration of Hockney’s masterpiece “PearBlossom Hwy,” is as fine a discussion of the twin arts of painting and photography as one is likely to find anywhere, especially in that it includes Rodin’s quote, “It is the artist who is truthful and the photograph that lies,” and then gives lie to that comment through a consideration of the work of Cartier-Bresson. In A Bigger Message, nothing is done by halves. Both the interviewer and the artist interviewer share candidly and insightfully, giving us a manuscript that is thoughtful, educational, and passionate. If there is to be a quibble with the book, a complaint, it is not with the words, but with the pictures. If half the value of this book is in its words, the brilliant language contained within, the other half is in the reproduction of the artwork of David Hockney and other masters, including Constable, Claude Lorrain and, of course, Vincent van Gogh. Yet this is where the publisher fails the reader. Although the book is printed on excellent paper stock, the size of the book itself and therefore the size of the color plates included are skimpy. This is in spite of the fact that the book itself boasts “161 illustrations, 154 in color.” Worst of all, with printing a series of works such as “Midsummer, East Yorkshire, 2004,” the plates are so very small that they resemble nothing so much as thumbnails on Internet art sites, leaving the reader attempting to click on the pictures to enlarge them, but to no avail. Ironically enough, the only pictures in the book that are published life-sized are those created on the aforementioned iPhone. Somehow, that doesn’t seem right. Would that the publisher have gone on the complete journey with Hockney and Gayford and made this the large-scale volume that it deserved to be so that the art could have been as easily absorbed as the wit and wisdom in the words.